What’s that? You’ve never infused alcohol with cannabis? Well, Rick and Kate’s guest has. And he wrote a book to teach you how to do it yourself: “Cannabis Cocktails, Mocktails and Tonics”. 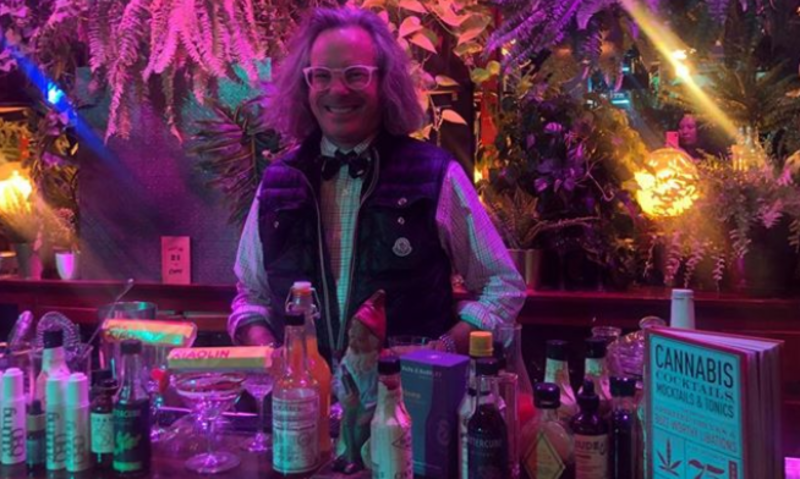 Warren Bobrow is a trained chef, mixologist, and Cocktail Whisperer, and he’s here to talk about his journey to becoming a Cannabis Alchemist. Did you know that in the 1800’s alcohol was a way to preserve cannabis? Warren talks with your hosts about medicinal and healing properties of cannabis, why you might choose to infuse cannabis into alcohol instead of food, which strains go with which alcohols, and the process of decarbing the cannabis so it has an effect when turned into a cocktail. They also touch on what’s legal (and not). Warren is a 5-time published author and was a Speaker at SXSW 2018 Conference and Festival. He has written articles for Forbes.com, Saveur magazine, Vodka magazine, Chilled, Prohbtd, and many other national and global periodicals. He was nominated for a Tales of the Cocktail Spirited Award in 2013, was a Ministry of Rum Judge in 2010 and a Rum XP judge in 2017, and was in the Saveur Magazine “100” in 2010. Today on Recommended Reading with Food Book Fair we explore the world of culinary cannabis with two leaders in the field — Warren Bobrow, author of Cannabis Cocktails and Jennifer Shelbo, former pastry chef turned expert in cannabis farming and sustainability. Recommended Reading with Food Book Fair is powered by Simplecast. Tune in at 5:30 EST! Economists once speculated that with the growth of technology, humans would have more time on our hands, and with it we’d expand into leisure activities. In fact, the opposite has happened: we’re working now more than ever. It’s hardly surprising: work gives us activities, meaning, purpose and community. But what if there’s more to life? Many feel the urge to take a step back, but it’s easier said than done. So how can we slow down while keeping up? This discussion draws insight from neuroscience, mindfulness and more to offer some answers. Wednesday, March 14th – The Me Convention! This week’s episode dives into everything from smoking to infusing and creating, discussing the politics behind the movement, and how it’s now being incorporated into mainstream society. Warren, also known as “the Cocktail Whisperer,” is a fascinating guy who started in the finance and banking industry, is a trained Chef, and now his main focus is the creation of classic and creative cocktails all over the world. Listen to Duffified here at Radio Influence! Listen to the Duffified Live show archive on Radio Influence! Subscribe to the show on Apple Podcasts, Stitcher, TuneIn Radio, and now on Google Play and make sure to rate and review!